This is Pelikan’s 2016 ink of the year. It is a teal colour, one of those in between shade. I think this is a love it or hate it colour. I personally prefer if it committed to either a darker teal or maybe a bright turquoise colour. As one friend remarked Pelikan Edelstein Aquamarine is sort of sitting on the fence. 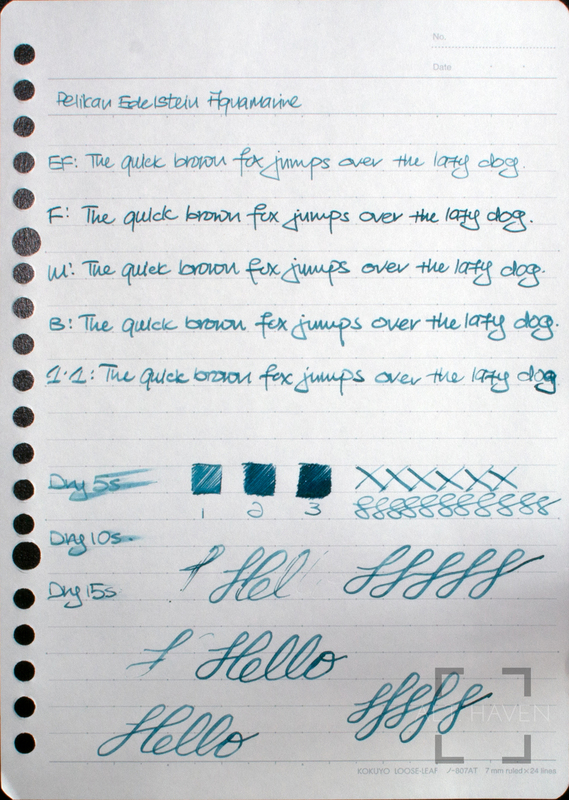 Pelikan Edelstein Aquamarine is a dry ink. It is best used in a wet nib. It worked really well in my Faber-Castell M nib. However I had a hard time getting my TWSBI nibs to write with this ink. As someone who is totally lacking in a comprehensive dry ink library, I am tempted to hang onto this bottle of ink though the colour just doesn’t speak to me.